AirportWatch | New report says UK airport emissions today cause about 110 early deaths per year, of which 50 are due to Heathrow. New report says UK airport emissions today cause about 110 early deaths per year, of which 50 are due to Heathrow. Premature deaths from Heathrow pollution would treble by 2030 if a third runway is built, according to an academic study to be published next week. The study says that even if Heathrow does not expand, increased numbers of flights will lead to a more than doubling in the number of deaths from pollution. The research is the first to analyse the health consequences of aircraft fumes at the 20 major airports of Britain. It reveals there would be major health benefits if Heathrow operations were replaced with a new hub in the Thames estuary. This is because Heathrow is located in a busy population centre, and also as the prevailing wind in London is westerly, the pollution is blown over millions of people. The research says that, based on 2005 data, UK airports contribute to 110 early deaths each year, mostly due to lung cancer and cardiopulmonary complaints. Of those, 50 can be attributed to Heathrow alone. With a 50% growth in air travel, but no new runways, there would be 250 early deaths in the UK of which 110 would be at Heathrow. 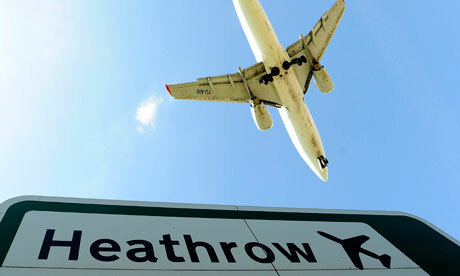 If a third-runway is built at Heathrow, early deaths due to emissions from Heathrow increase from 110 to 150. And that is not including road vehicle pollution, just that from planes. Premature deaths from Heathrow pollution would treble by 2030 if a third runway is built, according to an academic study to be published next week. Even if the airport does not expand, increased numbers of flights will lead to a more than doubling in the number of deaths from pollution, the authors conclude. The research, which is sure to be seized on campaigners and politicians opposed to Heathrow expansion, is the first to analyse the health consequences of aircraft fumes at the major airports of Britain. It reveals there would be major health benefits if Heathrow operations were replaced with a new hub in the Thames estuary. The study, which has been accepted by the peer-reviewed journal Atmospheric Environment, focuses on the public health effects of operations at the 20 largest airports in the UK, in particular those around London. It is not only exhausts during landing and take-off that degrade local air quality. Taxiing, airport support equipment and the jet-fuelled auxiliary power units that generate on-board electricity also add to the pollution burden. The researchers conclude that, based on 2005 data, UK airports contribute to 110 early deaths each year, mostly due to lung cancer and cardiopulmonary complaints. Of those, 50 can be attributed to Heathrow alone, they calculate. With government figures projecting a more than 50% rise in air travel over the next two decades, the public health effects are also expected to increase. If Heathrow is expanded with a third runway to allow for unconstrained growth, the airport would be responsible for 150 early deaths; UK-wide deaths would be 260. Even without the third runway, mortality figures will rise substantially. The researchers expect 250 deaths UK-wide, though those directly attributable for Heathrow would be 110, as other airports would carry more traffic. The researchers also modelled the radically different scenario of closing down Heathrow altogether and moving its operations to a new hub in the Thames Estuary – sometimes referred to as “Boris island” after the proposals by the London mayor, Boris Johnson. That would save 60 lives UK-wide, and the new expanded hub itself would be responsible for 50 early deaths, the same as Heathrow now, the study found. Relocating the airport would not make a big difference to the airport’s impact on climate change via CO2 emissions from planes. The projections are likely to feed into the government’s consultation on aviation and are due to be discussed next week by the London assembly’s health and environment committee, according to its chair Murad Qureshi. Epidemiologist Fintan Hurley, who led a major inquiry into pollution risks for the government’s advisory committee on the medical effects of air pollutants (COMEAP), welcomed the report, but noted that the additional effects of car and lorry journeys to Heathrow had not been included in the analysis. Future changes, by the addition of rail links for example, should be included in any full comparison of airport plans, he said. Many of the deaths could be avoided by relatively simple measures, Barrett argued. Airplanes get their electricity from onboard auxilliary power units – small jet engines that are often left running while the planes are at the stands. Plugging into the airport electricity supply would reduce those emissions. As would the use of electric vehicles for airport support operations. And using desulphurised fuel would add only 2% to fuel costs, while reducing the health effects by 20%. Altogether, mitigation efforts could halve the pollution from airport operations. Can we escape this either Heathrow or Boris Island debate. Many of us believe that we don’t need extra aviation capacity. What we need is to make better use of the existing airports and runways. The arguments for expansion have much more to do with BAA’s profits, than the needs of the UK economy. When the majority of flights from Heathrow are used for business, rather than leisure, then I might take the economic case more seriously. Very little of the expansion in recent years has been in business flights and very little of the predicted expansion is about business flights. Cut out the short haul and holiday destinations. Redirect slots to flights to the BRIC (Brazil, Russia, India, China) countries. It will hurt BAA profits, but will answer the people who think flying rather than video conferencing is the future. Approximately 110 people in the UK die early each year due to airport emissions today. Of these deaths, approximately 50 are due to emissions from London Heathrow. are due to Heathrow emissions. additional early deaths per year. reduced under the Thames Hub scenario. By 2030, this figure will increase by 170% even without airport capacity expansion. An expanded Heathrow would cause 150 early deaths per year in 2030. In comparison, a new Thames Estuary hub airport (to replace Heathrow) would cause 60-70% fewer early deaths due to the location of the airport with respect to the population and the prevailing wind direction. You can download the report and the pre-print of the full journal paper that has been accepted for publication in Atmospheric Environment. Posted: Friday, October 12th, 2012. Filed in General News, Recent News.